First used in ancient Rome and the far East thousands of years ago, wind chimes make an excellent addition to any garden or meditation area. They come in various shapes and can emit different tones depending on the materials used. You should find a place to hang your wind chime where the wind blows consistently. If you live in a windy area it's best to partly shelter the chime from the worst of the weather. Our favourite wind chime in 2017 is still the Woodstock Amazing Grace Chime. This is a good-sized, decent quality wind chime, that plays the melody "Amazing Grace" when the wind catches it. On this page we’ll look at the most popular wind chimes you can currently buy. The prices vary but they are mostly cheap to grab hold of. 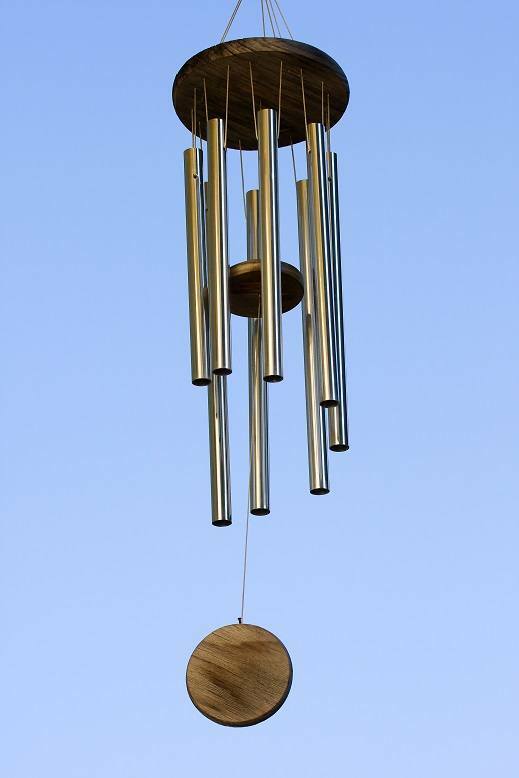 #5 - Woodstock "Pachelbel Canon"
The Woodstock Amazing Grace Chime is a traditonally-styled, metal wind chime. This chime is tuned to play the opening bars of "Amazing Grace" when the wind blows. It has 6 hollow aluminum tubes, so you don't have to worry about rust (aluminum cannot rust). The tubes are suspended from a bamboo top. The wind catcher is also bamboo. The strings are weather-resistant braided nylon. You can customise the wind catcher with your own design or engraving if you wish (though the manufacturer doesn't offer this service - you would need to organise this yourself). The total length is 24 inches, and weight is 1.4lb. There are also 15 inch and 40 inch versions available. The chimes are fully assembled in the packaging - all you need is to find or install a convenient hook to hang them from. This wind instrument has been precision tuned to make a wonderful sound when the wind blows - listen to the video below for a sample. This is usually slightly more expensive than the cheapest wind chimes, but in our opinion, worth the extra few dollars, considering the size and quality. Woodstock has been around for over 30 years, and is still run by the Grammy award-winning musician and instrument designer who founded the company. While the chimes are manufactured in China these days, the company is still American-owned and operated; They design all their chimes in the USA. This model comes with a 12 month warranty from the manufacturer. Woodstock also guarantees the tuning for life! The Pixpri Elegant Metal Design Windchimes are just over 30 inches from top to bottom. Like the Woodstock chimes above, the tubes are hollow aluminum. These chimes play a B Pentatonic scale - have a listen to them in the video below. The Pixpri chimes are fully assembled, and come with an S-hook, so you can hang them just about anywhere. They are quite sturdy, weighing around 2.5lb. There is a wind catcher attached to the bottom to make the magic happen. The intent of these chimes, with their hauntingly beautiful melody, is to serve as a reminder of a departed loved one or friend. They are beautifully made, though a little smaller than most of the other chimes here. The "In Loving Memory" chimes should provide a long-lasting reminder of your loved one. I THOUGHT OF YOU WITH LOVE TODAY windchime. Beautifully designed wind chime with angel wings, teardrops and jewels. This is a thoughtful condolence gift to remember a loved one. If you want something a bit more classical, then this might be the chime for you. It has been specifically tuned to play the notes of Johann Pachelbel’s Canon. The silver tubes are very stylish and hang from a black ash finished top. It comes with a matching black wind catcher. Do you own any of the wind chimes mentioned here? Did you choose a different one? Let us know in the comments!